If you're new to JKS Land or have only been following along for a short time, you may not know that Kpopway Radio devotes an entire two hour program to his and TEAM H's music every Friday morning and again in the evening. 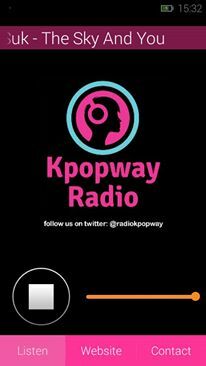 Kpopway is a Latin American station, broadcast entirely on the internet. No where else can you listen to it. Plus, there is no charge and no need to sign up or log in. All you have to do is click on their link and listen. Or you can download the Kpopway app for your phone or iPad from the App store or from Google play. Then, for two full hours you can listen to Jang Keun Suk's and TEAM H's music. Free of charge and with no commercials. If you love JKS' and TEAM H's music, then you don't want to miss Sukkie Lovers - named after one of Jang Keun Suk's nicknames - every Friday on Kpopway Radio. Sukkie Lovers is broadcast twice on Fridays. The first time from 10:30 to 12:30 Korean time and the second from 21:00 to 23:00 (9 pm to 11 pm) Korean time. If you're not sure what those hours are for your time zone, use this world clock converter. Just adjust the event time as indicated on the page and, voila, there's the correct time for your time zone. Then, tune in and listen. Or sing and dance along with JKS and TEAM H. It's a great way to put a smile on your face as you close out the work week and begin the weekend. Tune in to Kpopway Radio every Friday and let the good times roll! Please consider that KPOPWAY has a new channel to broadcast SUKKIE LOVERS. The direct link is this: http://kpopway.com/mixtape/ And this channel is not available in apps or TuneIn radio. Thanks!